Buying in bulk, portioning and freezing family packs of meat and produce have been a way for the busy home cook to save money on meals for a long time. Unfortunately the thawing, protecting from freezer burn, and remembering what you have in the freezer is sometimes a nightmare. I have learned, from trial and error, what works and what doesn’t so I thought I’d share some tips for freezer organization, food safety, and hassle-free dinners. I love my slide-zip freezer bags – I always have them on hand in gallon and quart sizes. I freeze a dinner-size portion of protein for the 4 of us in one bag. I also freeze smoothie fruit in a quart bag and just have it ready to dump in the blender. Sometimes I even add the protein powder to the fruit before I freeze it. It works great. If you prefer, you can wrap in butcher paper. I don’t find that this makes the meat last much longer though – UNLESS I first wrap it in a layer of plastic wrap. My mom uses her vacuum sealer and has very good luck with it. 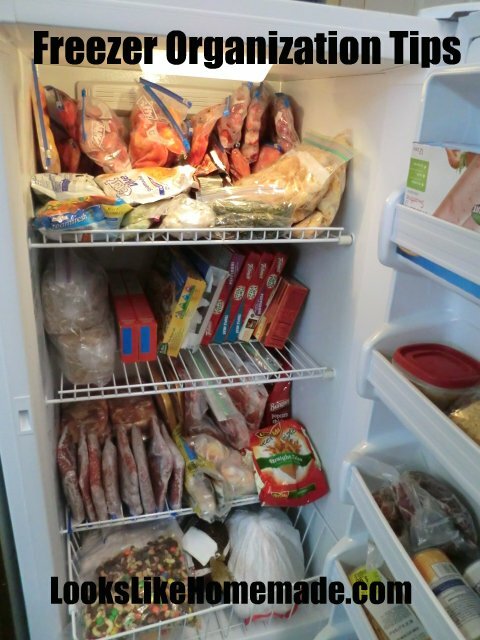 A well organized freezer is a key to knowing what you have. I have a shelf for fruits and veggies, a shelf for convenience foods, a shelf for meat, and a drawer for big things. I keep bread and miscellaneous things in the door. A cheap pair of warm gloves. I always hate it when my hands freeze while rummaging around int he freezer. 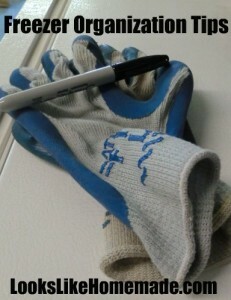 I keep a cheap pair of gloves on top of the freezer to slide on when I’m rummaging around. This keeps me from hurrying because my hands are cold. I always have 2 or 3 sharpies in my kitchen and by my freezer. be sure to mark what and when on your items. This is the best way to know what is new and what is old. freezer and much faster to freeze (safer) and thaw when it’s time to use your items. When you lay these in your freezer lay them flat until they’re frozen, then arrange however you like. Note: I saw a video over on the Ziploc Facebook page that I really wanted to share here – unfortunately they dont make their video sharable. They now have a product called perfect portion bags that allows you to portion your meat in smaller bags inside your large freezer bag. Great idea! Check out the Perfect Portion Bags. Now, I’m not one for uni-tasker kitchen products, so I think I am going to try this concept with regular fold top baggies instead of the perfect portion bags FIRST. If I don’t see much improvement with the baggies, I might try the perfect portion bags. Always ALWAYS use freezer bags. Storage bags arent insulated enough to protect your food. Get rid of things that are old or have freezer burn, its not worth the hassle and the risk. The Food Safety and Inspection Service recommends the specific guidelines when storing frozen food. I think I push the boundaries on some of these but stay pretty close. Rotate your food, put new on the bottom and old on top so you use the old first. Keep your freezer at around 0 degrees Fahrenheit. For every five degrees Fahrenheit above zero, the recommended storage time is cut in half, so this is important! The experts say you should freeze your food at 10-below Fahrenheit, and store it at 0 degrees Fahrenheit, but who can do that with one freezer? The coldest part of your freezer is the bottom, so you might try to freeze things in the bottom and organize it after things are solid. It is easier to maintain the 0-degrees Fahrenheit in a full freezer than a half-full or empty freezer. If you just don’t have that much frozen food, you can fill empty spaces with your flour, rice and dried beans. If a freezer doesn’t have to work as hard to maintain it’s temperature, you don’t have to pay as much to keep your food frozen.